The railway in Wensleydale is a remarkable survivor. Having lost its passenger services in 1954, and almost half its route mileage by the early 1960s, the line survived until 1992 by carrying limestone to the smelters on Teesside. When that traffic finished, the Ministry of Defence decided to use the line for the occasional transport of military vehicles and this traffic kept the line alive long enough for the Wensleydale Railway Association (formed in 1990) to build support and eventually form a company to take a 100 year lease on the 22 miles of line from Northallerton (Castle Hills) to Redmire. Bolton Castle is a spectacular medieval fortress situated in the heart of Wensleydale, with stunning views over the Yorkshire Dales National Park. Completed by Sir Richard Le Scrope, in 1399, its scars bear testament to more than 600 years of fascinating history making it an ideal venue for educational school visits covering topics from Medieval life to the English Civil War. The Castle is extremely well preserved with approximately one third of the rooms still intact and the rest of the Castle fully accessible giving great insight into its turbulent past. The authentic and atmospheric room displays show Castle life as it would have been in for the different members of the Castle community from the archers, cooks and monks to Mary, Queen of Scots and Lord and Lady Scrope. This small family run business invites visitors to observe the various processes involved in the manufacture of candles including traditional dipping techniques and casting methods. They have been making candles since 1971 and in 1978 moved to the old watermill by the waterfall in the quiet village of Wensley. Near the village of Aysgarth the River Ure tumbles over a series of broad limestone steps which are known as Aysgarth Falls. 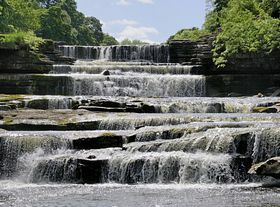 Although not particularly high the waterfalls are one of Wensleydale’s most famous beauty spots (having been featured in the Kevin Costner film “Robin Hood – Prince of Thieves”), with a pleasant riverside walk linking the Upper, Middle and Lower Falls. 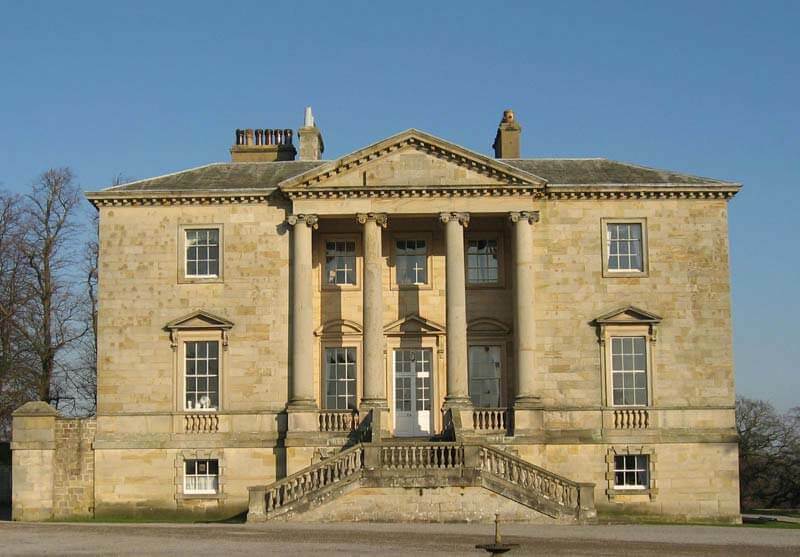 Constable Burton Hall is a handsome Palladian villa standing at the entrance to Wensleydale, North Yorkshire. Designed by the celebrated architect John Carr for Sir Marmaduke Wyvill, and completed in 1768, it is widely recognised as one of the finest medium-sized English houses built in the Palladian style. The Hall stands in extensive woodland and formal gardens which are open to the public from mid-March to mid-September. Stunning seasonal displays of snowdrops and daffodils carpet the woodland walks and garden trails, making it an absolute must for garden and nature lovers alike. Jervaulx Abbey is reputedly the second largest privately owned Cistercian Abbey in the U.K. Situated 17 miles North of Ripon at the entrance to Wensleydale. Set in 126 acres of beautiful parkland this Abbey is a majestic ruin and dominates the countryside it stands in. Take a trip back in time to where Wensleydale cheese-making began as you explore the museum, enjoy the Yorkshire Wensleydale Cheese Experience and see the cheese being made in the creamery. Then pop into the Wensleydale Cheese Shop & Deli or Gift Shop! 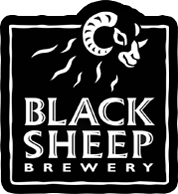 Experience brewing the Black Sheep way! – You’re guaranteed to have a great Yorkshire beer experience on one of the “shepherded” tours of the brewery. See the traditional brewhouse in action, bubbling beer in the fermenting rooms, learn how they brew their award winning beers and of course you will get to try a few of the beers back in the bar. Visit Masham to witness the creation of Ales, first hand – to experience the flavours and aromas of malted barley, hops and yeast for yourself. In fact, with a trained guide, you’ll be able to follow the entire brewing process: from blending the ingredients, through to filling the casks, to the craft of the cooper as straight pieces of oak are formed into curved staves to create a perfect cask to hold a precise amount of beer.